The Battle of Vimy Ridge was fought at the northernmost end of the Arras Offensive. 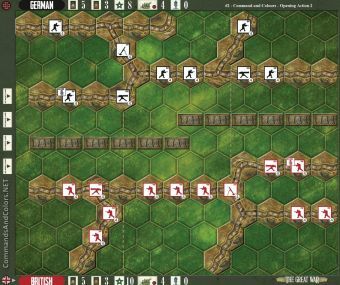 After studying the Battle of Verdun, the Canadian plan called for units to leapfrog over one another, as they advanced toward their objectives. The Germans recognized that it would be difficult to set up a defense-in-depth on the ridge. Their strategy was to place sufficient strength on the front line to defend against the initial attack, and then quickly move reserves forward, where needed, before the enemy could consolidate any gains. At exactly 5:30 am, 9 April, 1917, every artillery piece at the disposal of the Canadian Corps fired a synchronized barrage. Then, at predetermined increments, the artillery barrage moved forward, followed closely by the advancing infantry. 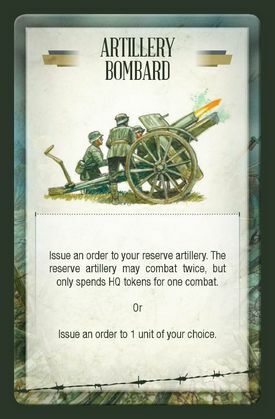 During the early fighting the German artillery was able to maintain a defensive fire, but it could not stop the advance and by 6:25 am, the 1st and 2nd Divisions reported capturing their first objective. 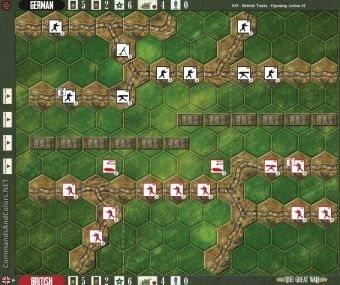 The Canadian forces gain 1 Temporary Victory Medal at the start of their turn, when one or more units occupy any German trench hex in the front line. The Canadian forces are racing against time. 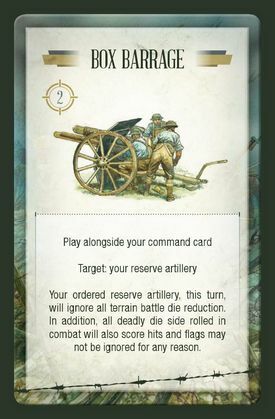 The German player may take a Victory Medal, instead of taking two command cards, when playing a “Recon” command card.